The Village of Sharon Springs is renowned for its unique architecture dating back to the time when this small village was an internationally famous health spa. Approximately 180 buildings, including bathhouses, hotels, and homes, dating from the mid-19th century and early-20th century, are listed on the National Register of Historic Places. An historic walking tour along Main Street gives you a glimpse and insight into the lives of those who lived here during Sharon Spring’s Victorian times. By hiking or driving the highways and secondary roads you will see the breathtaking views of the countryside. The rocks to the west of the village have attracted geology buffs for years. Bowmaker’s Pond is home to many forms of plant and bird life. July and August brings free outdoor concerts and the opening of the Museum and Schoolhouse exhibits. Throughout the year, the Spring Garden Party Festival, the Father’s Day Tractor Pull, garlic festival, craft fairs, 4th of July parade, the Community Wide Garage Sale, self guide walking tours, Poetry Festival, the Harvest Festival and the Victorian Holiday Celebration as well as other area events celebrate Sharon’s ever changing seasons. Sharon boasts many magnificent views. This particular view is looking north over the Mohawk Valley from Clausen Ridge on Route 20. Another view that is especially spectacular is on Route 20 West toward Cherry Valley, looking north toward the Mohawk Valley. A few other areas where the views are exceptional are Route 10 south, Goodrich Road, Kilts Road, Beechwood Road, Green Road, and Center Valley Road. Geology buffs have been attracted for years to the rocks along Route 20 just east of the village and also to Leesville, about 2 miles east of Sharon Springs. Students from the area colleges come armed to study the formations and record their findings. The area is easily accessible right next to the highway. Bowmaker’s Pond, located on Route 10 just south of the Village, is a result of a $266,000 project. Half of the money came from the State’s Clean Water and Clean Air Bond Act and Sharon raised the rest through donations of cash and services. The project involved draining the wetland area of the pond, removal of a beaver dam, and cleaning out the muck. Much of the pond was filled in and dredged to bring Bowmaker to its planned 14.8 acres and restore the pond from its swampy state to the recreational pond it once was. There is now a picnic area, fishing and canoeing. A crescent-shaped island was created for nesting geese and other waterfowl. This quiet haven is ideal for bird-watching. The Sharon Museum Complex consists of a museum, storage barn, one-room schoolhouse and three-room outhouse. Esther Sticht gave the land and buildings to the Village of Sharon Springs in memory of her family who resided here for many years. The one-room schoolhouse, commonly known as the Chestnut Street School, was built prior to 1864 and closed in the early 1930s. The last teacher to conduct classes was Sylvia Lane. The school was located just off Chestnut Street, about three miles west of Sharon Springs. 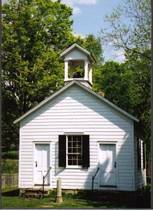 The Sharon Historical Society assumed responsibility for the schoolhouse and in the fall of 1989 moved it to the Museum grounds. The unique three-room outhouse once stood behind the school at its original location and was moved to the complex with the schoolhouse in 1989. 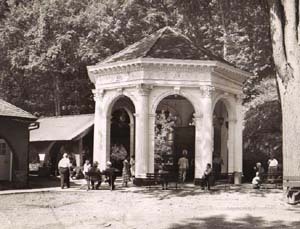 In 1927, Alfred Gardner built the beaux-arts style White Sulphur Temple that replaced an earlier one. This elaborate, classical, and octagonal temple features eight fluted columns topped by plaster Corinthian capitals, which support an elaborate cornice decorated with brackets shaped like acanthus leaves and dentils. It is listed on the National Register of Historic Places. The sulphur water is 48 degrees Fahrenheit and flows freely year around. 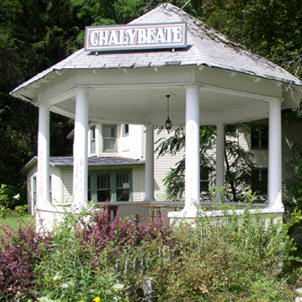 The Chalybeate Spring Temple, built in 1910, simple in design, is located along Main Street (Route 10 North), a few hundred feet south of the sulphur and magnesia springs. The Chalybeate Spring contains iron and was especially beneficial for treating anemia. The Chalybeate waters reputedly had enough iron salts to turn one’s teeth brown, nevertheless it was bottled and sold for its medicinal use. Listed on the National Register of Historic Places, the Temple has been renovated and summer concerts are held in the park. The most unique of Sharon Spring’s temples is the elaborately ornamental, domed Magnesia Temple. In 1860, a man of wealth, Henry J. Bang, began beautifying the grounds around the springs by building arbors, temples and laying out walks. The Magnesia Temple, ca. 1863, is the only remaining structure of the Congress Hall complex which once included bathhouses, a bandstand, and gardens. The triangular pediment, dentils in the cornice, and Corinthian columns identify it as Renaissance Revival. Stone steps lead to the fountain where famously refreshing and medicinal magnesia waters once spouted from the mouths of the twin stone lion heads. A tongue and groove wood ceiling, which was painted a beautiful azure blue, resembled a night sky scattered with golden stars. Magnesia water is beneficial for various problems of internal organs. Over 140 years later, the temple, although in need of repair, still symbolizes the spa’s glorious past. Listed on the National Register of Historic Places, the temple is located on the grounds of a private residence and not available to visitors, however it is clearly visible from Main Street (Route 10 North). The Harry Eldredge Mitchell Collection is composed of two major components: 40 frames (approximately 36″ x 30″) containing photographs and other ephemera of Sharon and approximately 1,000 Indian Artifacts, including arrowheads and tools. Harry Mitchell grew up in Sharon Springs and graduated from Sharon Springs Union Free School in 1897. Throughout his entire life, Mitchell roamed the countryside in search of Native American relics, and always maintained an active interest in the history of Sharon. He amassed an extensive collection of historical material of the area, dating from the pre-Revolutionary War period to the early 1930s. His collection was catalogued, assembled, and placed on display at the Sharon Springs Central School. His collection of Native American artifacts is also displayed in a large case in the School Library. 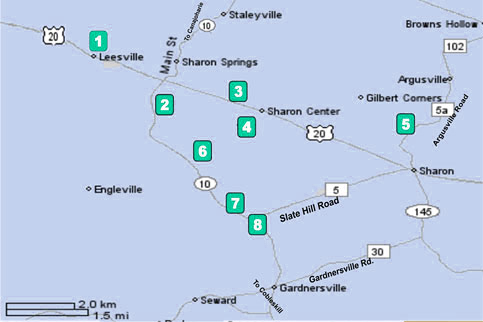 Sharon Springs Central School is located on Route 20 in the center of the village. The collection can be seen by calling 518-284-2266 during school hours for an appointment or by checking in at the Main Office for a visitor’s pass. There are eight historical markers in the Town of Sharon. Three are located on Route 20; two at Sharon Center and one in Leesville. Four are on Route 10; one just south of Route 20 near Bowmaker’s Pond, two near the Seward-Sharon Town lines, and the other by Beekman’s Mansion. The eighth marker is located on Argusville Road, about one mile north of Route 20 at Sharon Hill. 1. Leesville, N. Y. Calvin Rich settled here in 1784. Here stood the tollgate on the Great Western Turnpike. 2. Town of Sharon originally named New Dorlach after Dorlach in German Palatinate. Name changed to Sharon after Sharon, Conn. in 1797. 3. Camp of Cedar Swamp July 10, 1781, Tory Captain Dockstader with 500 Indians were routed here by Capt. Willett and Battle of Sharon occurred just west of here. 4. Sharon Battle on South side of road Col. Willett’s command defeated Tory and Indian raiders July 10, 1781. 6. Old Loonenbergh Turnpike This old turnpike surveyed in 1802 was the main route of travel for stage and oxcart from Hudson River Valley north and west. 7. William Beekman Mansion built 1802. William Beekman was first judge of Court held in Schoharie County. Died here Nov. 26, 1845. Buried on this farm. 8. First Lutheran Congregation in Schoharie County founded in 1745 by Rev. Peter N. Sommers. When seen on Route 20, Sharon Springs appears no different than other farming communities along the highway. Turn north onto Route 10 and one is startled to find classical temples, rambling hotels, and an imposing structure designated Imperial Baths. These buildings reveal Sharon Springs as different from its neighbors, a rare survivor of the once popular mineral water spa. New railroads facilitated travel to Sharon Springs, and when the Pavilion Hotel was built beginning in 1836, Sharon Springs, too, had a hotel worthy of the Vanderbilts and Van Rensselaers who came to stay there. 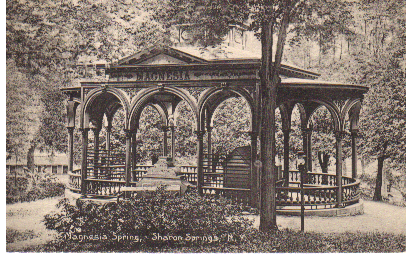 Sharon Springs peaked as a fashionable resort for the social elite in the early 1880s. The architecture of Sharon Springs is a remnant of what it was in the village’s heyday, but that remnant conveys the feeling of the village’s past. The self-guided tour includes sixteen structures including the Magnesia Temple, Lower Bath House, Imperial Baths, Cabin Camp, Adler Hotel, Stone House, Pavilion Cottage, 3 houses on Washington Street, Trinity Church, Trinity Church Rectory, American Hotel, Smith, Empie & Smith building, The Roseboro Hotel, Klinkhart Hall, and a house on Main Street. A brochure outlining this architectural tour can be found at the Sharon Museum, Library, Town Office, Village Office, or Cobbler & Co.